Yesterday was hug a climate scientist day. Dear readers, you missed out if you didn’t get to one, because there were a whole bunch of climate scientists at the State Library of Victoria being very huggable. 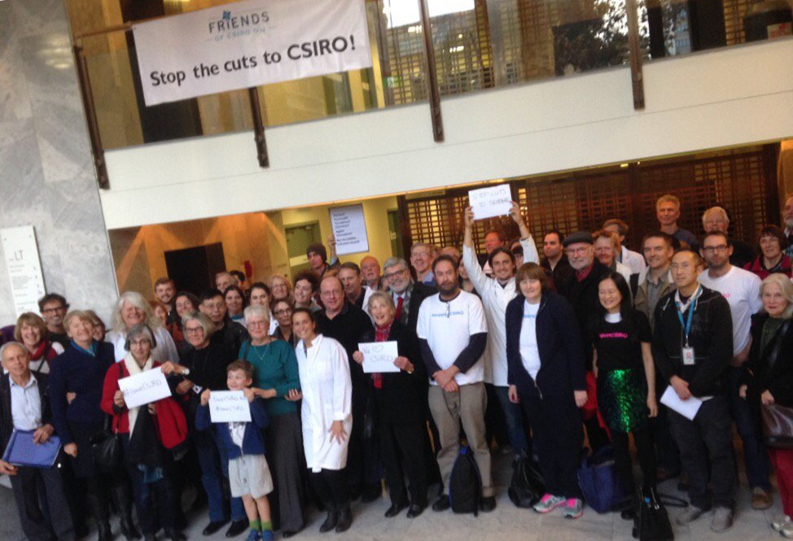 And other friends of CSIRO. The following is a statement prepared by a group of climate scientists in response to the recent announcement of cuts by CSIRO. It was released today at lunchtime by scientists attending the Australian Meteorological and Oceanographic Society 2016 Conference. We strongly believe that the proposed cuts to CSIRO (announced 4/2/16) will seriously undermine Australia’s capacity to respond to the challenges posed by climate change. Some 100 positions are to be cut in CSIRO’s Ocean and Atmosphere Flagship as part of 350 lost positions across the organisation. This will cripple CSIRO’s climate research. CSIRO (the Commonwealth Scientific and Industrial Research Organisation) is facing another round of job losses to basic public research, with the news that the organisation is making deep staffing cuts to areas such as Oceans and Atmosphere and Land and Water. Internally, there are signals that Oceans and Atmosphere will be cut substantially, amid 350 job losses over two years across the organisation. CSIRO pioneered climate research … But we cannot rest on our laurels as that is the path to mediocrity. Our climate models are among the best in the world and our measurements honed those models to prove global climate change. That question has been answered, and the new question is what do we do about it, and how can we find solutions for the climate we will be living with? Yesterday the Bureau of Meteorology and CSIRO released their State of the Climate 2012 report and today the Climate Commission released The science behind southeast Australia’s wet, cool summer. Both documents outline the latest changes with clear explanations and useful diagrams. State of the Climate 2012 showed a general trend toward increased spring and summer monsoonal rainfall across Australia’s north, and a decline in late autumn and winter rainfall across southern Australia. Sea-levels had risen around Australia at rates equal to or greater than the global average, and sea-surface temperatures in the region had increased faster than the global average. State of the Climate 2012 documents the annual growth in global fossil-fuel CO2 emissions and other greenhouse gases. The CO2 concentration of the atmosphere had risen to around 390 parts per million in 2011, a level unprecedented in the past 800,000 years. During the past decade it has risen at more than 3% per year, which is projected to cause significant further global warming. Most parts of Australia have experienced exceptionally heavy rains over the past two years, filling many dams around the country and breaking the drought of 1997–2009. There has been much confusion in the media about what this means for climate change. This report seeks to set the record straight. Climate change cannot be ruled out as a factor in recent heavy rainfall events. The Sea Surface Temperatures (SSTs) around northern Australia during the spring and early summer of 2010–2011 were the highest on record. This has very likely contributed to the exceptionally heavy rainfall over much of Australia in the last two years. La Niña events bring high SSTs to the seas around northern Australia, but warming over the past century has also contributed to the recent record high SSTs.